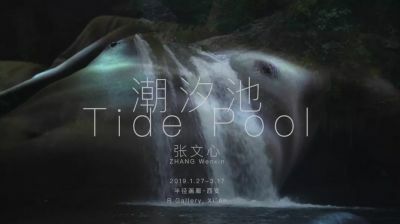 R Gallery is announcing with honor that we are going to hold artist ZHANG Wenxin’s Solo show "Tide Pool" from Jan.27 to Mar.17. People find tides in many places. Black liquid with white foam washing over the coastal highway at night, lover’s lips passing silent words, shore sunken into pain with its bare muscles and bones, wet light-colored blouse hanging on the balcony, wind with unknown purpose... Here at another time, the tide was wild and grooving, but it was bound to turn into potential energy of peace, stirring people's consciousness, letting it emerge from the pond of experience that was as thick as a swamp. At a chance as rare as gold, in a moment disappearing, the fortunate and the prepared will gain the courage to rename everything. So the tides, too, have become tides that are only true to themselves.